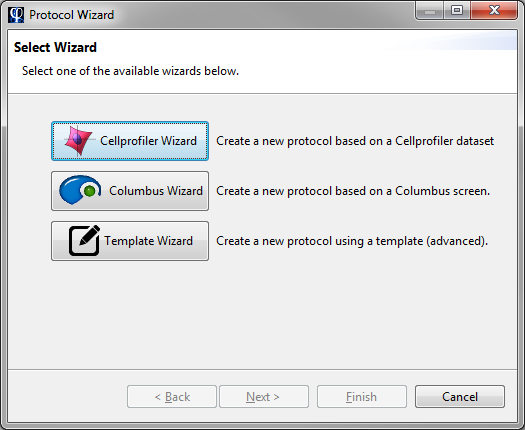 The Phaedra Cellprofiler feature offers a wizard to facilitate the importing and processing of Cellprofiler data in Phaedra. To start working with Cellprofiler data, you first need to set up an appropriate protocol in Phaedra. 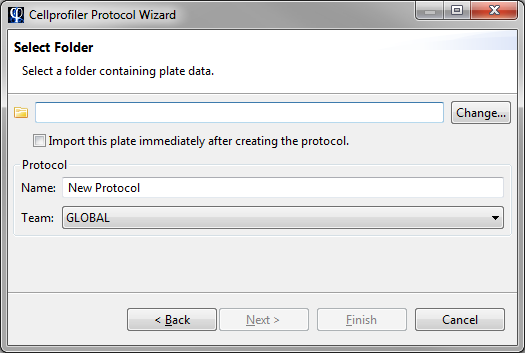 To do this, open the File menu, select Create New Protocol, and then select CellProfiler Wizard. In the first page, you are asked to select a data folder. This folder must contain sample data for a single plate, and will be used to determine the folder layout and file name patterns. Then you should select the folder Plate 1. In addition, you can enter a name for the protocol, and select the team that shall have access to the protocol. 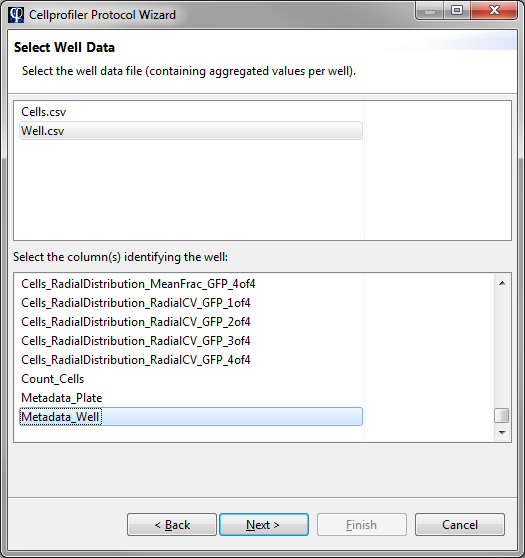 In the second page, you are asked to select the well data file, and the column that identifies the well (by number or position). In the next page, you can configure the importing of subwell data. Subwell data is the general term for either cell data, timepoint data or any other data that consists of multiple data points per well. 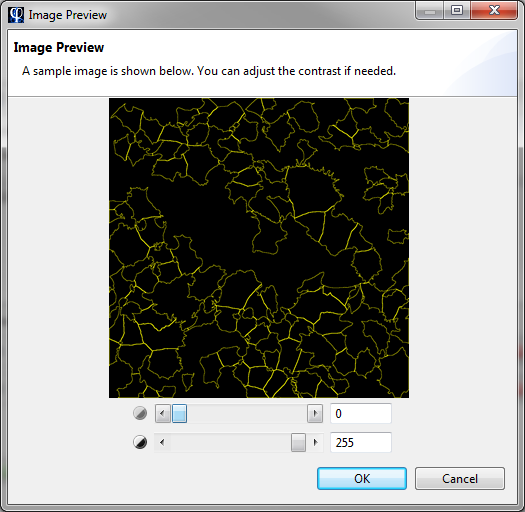 One file per plate: select the file containing all the subwell data. You must also select the column(s) that contain the well id. 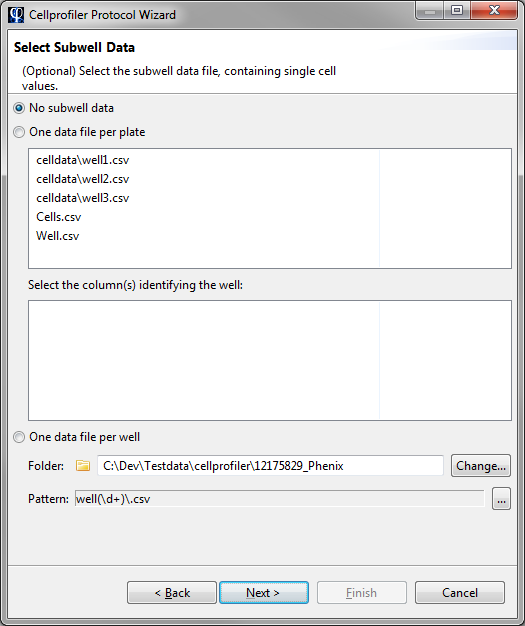 One file per well: select the folder containing the subwell data files, and provide a pattern to identify the files. Note that the pattern must contain at least one group that identifies the well id. In the next page, you can configure the image channels. First, select the folder containing the images, if any. If your dataset has no images, you can skip this step. Then, add a channel for each image you wish to import into Phaedra. For example, if you have 3 images per well (say, 3 marker stains), you should define 3 channels. 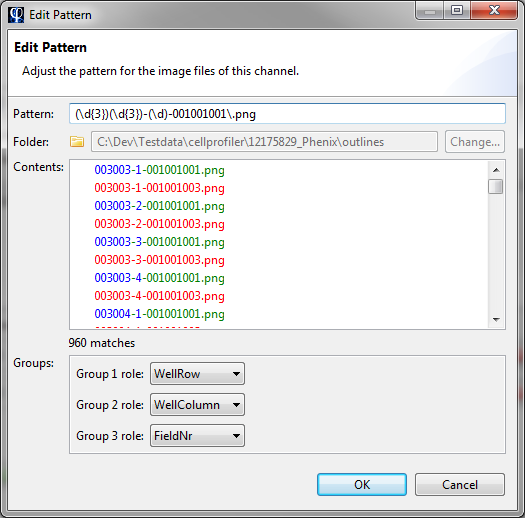 The most important aspect of channel configuration (and also the most tricky one) is the file pattern. This pattern must capture exactly those images that belong to the channel, and it must also specify the well identifier group, and the field group (if any). Click the ... button to change the file pattern. The patterns are specified using Java regular expressions. Groups are captured using round brackets, and their meaning is specified in the Groups table below the file list. The pattern captures 3 groups. Group 1 and group 2 contain 3 digits each, and represent the well row and column respectively. Group 3 contains a single digit and represents the field number. The rest of the pattern is fixed. Note that if your pattern specifies a field group, the field images will be automatically montaged into a single mosaic image during import. In the file list, the pattern will be tested against the available files. If the file name matches, it will be colored green, and any captured groups will be colored blue. If the file name does not match, it is colored red. Pay attention to the number of matches displayed below the file list. It should be equal to the number of wells times the number of fields. When you are done specifying the pattern, click the Ok button. You can now preview the image using the Preview button. If the image is poorly visible due to a large contrast range, you can specify a custom contrast stretch here. When you are done configuring all image channels, click Finish to create the protocol. 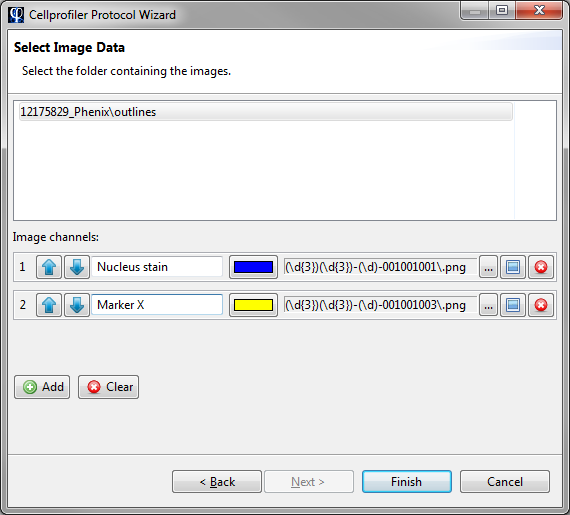 The destination protocol has been set up using the Cellprofiler protocol wizard. The source is a regular folder, containing one or more plate folders. Each plate folder contains at least a CSV data file, and optionally a set of images.